The BBC has an excellent, very long magazine piece – including videos – about how Israel keeps the memory of the Holocaust alive as the remaining survivors dwindle. The Israeli delegation is marching in the footsteps of the many Jews who took their last steps here. This is the spot where German SS officers rapidly assessed which prisoners looked fit and strong enough to be sent to the wooden blockhouses where the slave labourers lived. The Germans had taken a timber building originally designed to house about 50 cavalry horses and adapted it to the demands of the prison camp. Four hundred prisoners were crammed into the same space, packed on to double-decker bunks. In freezing rooms on starvation rations only a few lived for more than a few months. The rest were herded towards the gas chambers. It was murder on an industrial scale – whole communities perished together within hours of climbing down from the trains. So the most moving moment in the Israeli soldiers’ journey comes inside one of the old blockhouses, where a handful of them read out loud lists of the names of family members who died in the Holocaust. Sometimes almost nothing is known to tell the stories of lives that were not lived, except a name. As Yishai Szekely – a doctor who serves as a reserve officer in an artillery unit – explains, in some families first-hand memories are passed down. There are photographs or books and ornaments with stories attached, that make the dead seem real. Here, the reading of the names is the only way to reclaim the dead from the anonymity of genocide. When the last name has been read, I stroll between the blockhouses with Yechiel Aleksander, who was brought to Auschwitz as a teenager in 1944, on one of the Eastern Transports – the trains that carried the Jews to the selection process between life and death. He survived of course and went to Israel after the war. This is his 35th trip back to Poland with Israeli delegations to deliver lectures about what life was like here and to answer questions when he can. The first nine or 10 trips back here affected him very badly, he says. For a moment, switching between Hebrew and the fluent Polish he still remembers from childhood, he is lost for words. He describes how the visits depressed him, by holding his hand out straight and level and then suddenly bringing it down in a plunging, swooping motion. He still comes, though. He believes that those who know what it was like here have a special responsibility towards those who do not. He remembers discussing the expulsion of the Jewish community from Spain at the end of the 15th Century with a group of Israeli schoolchildren and realising that most didn’t know anything about it. What, he wondered, if the Holocaust were to be forgotten in the same way, two or three generations from now? A few years ago the Israeli newspaper Yediot Ahronot published the extraordinary story of a photograph which hung on the wall of the office of Meir Dagan, who rose to become head of Mossad, Israel’s external intelligence agency. It is a slightly battered black-and-white print showing a scene from 1942 in the village of Lukow in central Poland. 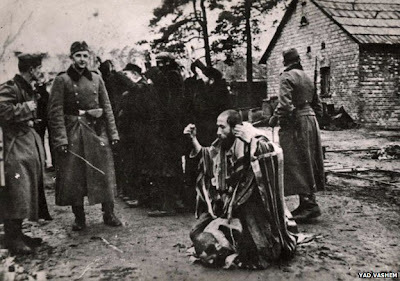 An older Jewish man is kneeling on the floor surrounded by German soldiers. It is Meir Dagan’s grandfather, who is known to have been murdered a short time later. The picture came to light when Dagan’s father returned to his home village after the war, to look for Jewish survivors. They asked a local Polish man to take some photographs. When he handed over the film roll and they eventually had it processed, they discovered at its start the picture of the Germans surrounding the helpless old man. The photographer must have been taking photographs for the newly-arrived Nazis too. The photograph is appalling, but it’s historically interesting too. The young Germans are not Aryan supermen but ordinary soldiers called up into their reserve infantry battalions for service in Poland. It’s worth examining the soldier’s attitudes – they do not look to me like men who feel they’ve been caught doing something reprehensible. They look like men posing for a photograph which they intend to display on the mantelpiece in years to come. Meir Dagan rose to become one of the most powerful men in Israel and throughout his career he had the photograph of his grandfather and the Germans on the office wall.